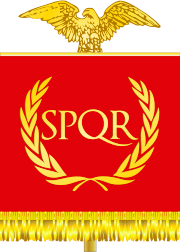 Polybius, the Roman historian, believed that the Pax Romana, the territory over which the Roman Standard flew, was the culmination of history at that point in time. Polybius (c. 203 B.C.E. 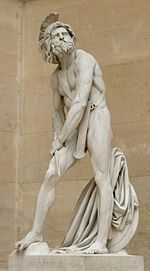 – 120 B.C.E., Greek Πολύβιος) was a Greek historian of the Hellenistic Period noted for his book called The Histories covering in detail the period of 220 B.C.E.–146 B.C.E. He is also renowned for his ideas of political balance in the government, which was later used in Montesquieu's The Spirit of the Laws and the drafting of the United States Constitution. It was during the Renaissance that Polybius' works resurfaced in anything more than a fragmentary form. His works appeared first in Florence. Polybius gained something of a following in Italy, and although poor Latin translations hampered proper scholarship of his work, he contributed to historical and political discussion there. Machiavelli appeared to have been familiar with Polybius when he wrote his Discourses. Vernacular translations in French, German, Italian, and English first appeared in the sixteenth century. In the late sixteenth century, Polybius found a greater reading audience among the public. His idea that history should teach practical lessons, and that events need to be understood in their wider context, gives a moral dimension to historical reconstruction. What has been called his moral vision informed his writing, rooted in his conviction that the stability of Roman governance was itself a moral good. Despite his alleged pro-Roman bias, he made an effort to write objectively. His writing reveals the range of human emotion, enabling readers to think and feel their way into the narrative. People who look to history to learn pragmatic and moral lessons are likely to regard Polybius's historiography with appreciation. Perhaps a safe, secure, and stable world can be built if lessons can really be learned about past successes and failures. He coined the term universal history (historia katholike). 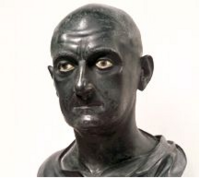 This bust of Scipio Africanus the Elder is at the National Museum in Naples, Italy. As the former tutor of Scipio Aemilianus, the famous adopted grandson of the general Scipio Africanus, Polybius remained on terms of the most cordial friendship and remained a counselor to the man who defeated the Carthaginians in the Third Punic War. The younger Scipio eventually captured and destroyed Carthage, in 146 B.C.E. Polybius was born and raised in the Achaean city of Megalopolis. Polybius was a member of the Greek governing class, with firsthand opportunities to gain deep insight into military and political affairs. His political career was devoted largely towards maintaining the independence of the Achaean League. His father, Lycortas, was a chief representative of the policy of neutrality during the war of the Romans against Perseus of Macedonia. He attracted the suspicion of the Romans, and as a result, his son Polybius was one of the 1000 noble Achaeans who in 168 B.C.E. were transported to Rome as hostages, and detained there for 17 years. In Rome, by virtue of his high culture, he was admitted to the most distinguished houses, in particular to that of Aemilius Paulus, the conqueror in the Third Macedonian War, who entrusted him with the education of his sons, Fabius and the younger Scipio. When the Achaean hostages were released in 150 B.C.E., Polybius obtained leave to return home, but in the very next year he went with his friend to Africa, and was present at the capture of Carthage that he described. It is likely that following the destruction of Carthage, he journeyed down the Atlantic coast of Africa as well as Spain. After the destruction of Corinth in the same year, he returned to Greece and made use of his Roman connections to lighten the conditions there; Polybius was entrusted with the difficult task of organizing the new form of government in the Greek cities, and in this office gained for himself the highest recognition. The succeeding years he seems to have spent in Rome, engaged on the completion of his historical work, and occasionally undertaking long journeys through the Mediterranean countries in the interest of his history, more particularly with a view to obtaining firsthand knowledge of historical sites. It also appears that he sought out and interviewed war veterans in order to clarify details of the events he was writing about, and was given access to archival material for the same purpose. Little is known of Polybius' later life. He most likely journeyed with Scipio to Spain and acted as his military advisor during the Numantine War, a war he later wrote about in a lost monograph on the subject. It is also likely that Polybius returned to Greece later in life, since there are many existent inscriptions and statues of him in Greece. There is a report of his death in 118 B.C.E. after falling from a horse, although this is only recorded in one source and that source is known to be unreliable. Titus Livius, an early twentieth century depiction. Polybius wrote several works, the majority of which are lost. His earliest book was a biography of the Greek statesman Philopoemen, which was used as a source by Plutarch. The Polybian text is lost. In addition, he wrote what appears to have been an extensive treatise entitled Tactics, which detailed Roman and Greek military tactics. Small parts of this work may survive in his major Histories, but the work itself is also lost. Another missing work was a historical monograph on the events of the Numantine War. The largest work was of course, his Histories, which we have mostly intact but with some missing books and fragmentary material. Livy makes reference to and uses him as source material in his own narrative. Polybius is one of the first historians to attempt to present history as a sequence of causes and effects, based on a careful examination of tradition and conducted with keen criticism. He narrated his History about what he had himself seen and based on the communications of eyewitnesses and actors in the events. In a classic story of human behavior, Polybius captures it all: Nationalism, xenophobia, duplicitous politics, horrible battles, brutality, etc. ; along with loyalty, valor, bravery, intelligence, reason, and resourcefulness. With his eye for detail and characteristic critically reasoned style, Polybius provided a unified view of history rather than a chronology. He also tried to place Rome within what he saw as world affairs, anticipating what would later be called world history; he coined the term universal history (historia katholike) while the notion of "world history" has at least "nominal roots" in his work. 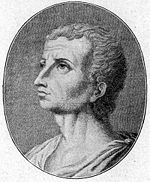 There is some evidence that he saw the Pax Romana as the end of history, providing as it did extraordinary opportunities for "for finding out about the world." Polybius is considered by some to be the successor of Thucydides in terms of objectivity and critical reasoning, and the forefather of scholarly, painstaking historical research in the modern scientific sense. According to this view, his work sets forth the course of occurrences with clearness, penetration, sound judgment and, among the circumstances affecting the result, lays especial stress on the geographical conditions. It belongs, therefore, to the greatest productions of ancient historical writing. The writer of the Oxford Companion to Classical Literature (1937) praises him for his "earnest devotion to truth" and for his systematic seeking for the cause of events. He saw history's purpose as didactic, to teach pragmatic lessons that assist people in taking political and military decisions. Believing in the "moral superiority" of Rome, his writing is also informed by what has been called a "moral vision" despite what he describes as his pragmatic approach; "Polybus was not at all an exception to the tradition of Greek historical writing that emphasized the moral lessons to be drawn from contemplation of the past." His conception of Rome's moral superiority was rooted in his conviction that Roman governance was stable, that Roman law was just and the extension of Roman rule secured peace wherever the Roman standard flew. Rome build on and was the successor of previous imperialism empires, such as the Assyrian, the Medes, the Persia and especially that of Alexander the Great. This concept of "imperial succession" dates back to Herodotus. Recently, Polybius's writing has come under a more critical assessment. In Peter Green's view (Alexander to Actium), he is often partisan and aims to justify his and his father's careers. He goes out of his way to portray the Achean politician Callicrates in a bad light; thus, leading the reader to suspect that this is because Callicrates was responsible for his being sent to Rome as a hostage. More fundamentally, he—as first a hostage in Rome, client to the Scipios and then finally as a collaborator with Roman rule after 146 B.C.E.—is not free to express his true opinions. Green suggests that we should always keep in mind that he was explaining Rome to a Greek audience to convince them of the necessity of accepting Roman rule – which he believed was inevitable. Nonetheless, for Green, Polybius's histories remain invaluable and the best source for the era he covers. Ron Mellor also agrees that Polybius is partisan who, out of loyalty to Scipio, vilified Scipio's opponents (the historians of Ancient Rome). The British author Adrian Goldsworthy also constantly mentions Polybius connections with Scipio when using him as a source for the latter's time as a general. Polybius has been noted to be hostile to some of his subject material; for example, his treatment of Crete has been noted to be biased in a negative sense. On the other hand, Hansen notes that Polybius Coverage of Crete supplied an extremely detailed account of ancient Crete. In fact, observations made by Polybius (augmented by passages from Strabo and Scylax) allowed deciphering of the location of the lost ancient city of Kydonia on Crete. Polybius introduced some theories in The Histories. In the work, he also explained the theory of anacyclosis, or cycle of government, an idea that Plato had already explored. Polybius was responsible for a useful tool in telegraphy which allowed letters to be easily signaled using a numerical system. This idea also lends itself to cryptographic manipulation and steganography. This was known as the "Polybius square," where the letters of the alphabet were arranged left to right, top to bottom in a 5 x 5 square, (when used with the modern 26 letter alphabet, the letters "I" and "J" are combined). Five numbers were then aligned on the outside top of the square, and five numbers on the left side of the square vertically. Usually these numbers were arranged 1 through 5. By cross-referencing the two numbers along the grid of the square, a letter could be deduced. Polybius was not especially admired by his contemporaries, to whom his lack of high Attic style was seen as a detriment. Later Roman authors writing on the same period, Livy and Diodorus especially, adapted much of his material for their own uses and followed his work extensively. As the Roman position was cemented in Europe, however, Polybius began to decline in popularity. Tacitus sneered at his description of the ideal mixed constitution, and later Imperial writers were generally ignorant of him. Polybius's work lived on in Constantinople, although in something of a mangled form, in excerpts on political theory and administration. Nonetheless, it was not until the Renaissance that Polybius' works resurfaced in anything more than a fragmentary form. His works appeared first in Florence. Polybius gained something of a following in Italy, and although poor Latin translations hampered proper scholarship of his work, he contributed to historical and political discussion there. Machiavelli appears to have been familiar with Polybius when he wrote his Discourses. Vernacular translations, in French, German, Italian and English, first appeared in the sixteenth century. In the late sixteenth century, Polybius also found a greater reading audience among the learned public. Study of the correspondence of such men as Isaac Casaubon, Jacques Auguste de Thou, William Camden, and Paolo Sarpi reveals a growing interest in Polybius' works and thought during the period. Despite the existence of both printed editions in the vernacular and increased scholarly interest, however, Polybius remained an "historian's historian," not much read by the public at large. Printings of his work in the vernacular remained few in number—7 in French, 5 in English, and 5 in Italian. Polybius' political beliefs have had a continuous appeal to republican thinkers, from Cicero, to Charles de Montesquieu, to the Founding Fathers of the United States. Since the Enlightenment, Polybius has generally held most appeal to those interested in Hellenistic Greece and Early Republican Rome, and his political and military writings have lost influence in academia. More recently, thorough work on the Greek text of Polybius and his historical technique has increased academic understanding and appreciation of Polybius as a historian. According to Edward Tufte, Polybius was also a major source for Charles Joseph Minard's figurative map of Hannibal's overland journey into Italy during the Second Punic War. ↑ Paul Harvey, The Oxford Companion to Classical Literature (Oxford: Oxford University Press, 1984, ISBN 9780198661030), 340. ↑ Michael C. Hogan, Field Notes, The Modern Antiquarian. Retrieved October 25, 2008. ↑ Polybius, Walbank, and Scott-Kilvert (1979). ↑ Edward Tufte, Minard's figurative map of Hannibal's war. Retrieved October 25, 2008. Burke, Peter. 1966. A Survey of the Popularity of Ancient Historians, 1450-1700. History and Theory 5(2): 139-141. Davis, Marshall Davies. Polybius and the Founding Fathers: The separation of powers. mlloyd.org. Retrieved October 25, 2008. Eckstein, Arthur M. 1995. Moral Vision in the Histories of Polybius. Hellenistic culture and society, 16. Berkeley: University of California Press. ISBN 9780520085206. Edwards, Col. H. J. Short introduction to the life and work of Polybius. Penelope. Retrieved October 25, 2008. Goldsworthy, Adrian Keith. 2003. In the Name of Rome: The Men Who Won the Roman Empire. London: Weidenfeld & Nicolson. ISBN 9780297846666. Green, Peter. 1990. Alexander to Actium: The Historical Evolution of the Hellenistic Age. Hellenistic culture and society, 1. Berkeley: University of California Press. ISBN 9780520056114. Herman Hansen, Mogens. 1995. Sources for the Ancient Greek City-State: Symposium August, 24-27. Kgl. DK: Videnskabernes Selskab. ISBN 8773042676. Hogan, C. Michael. 2008. Cydonia. The Modern Antiquarian. Retrieved October 25, 2008. Kelley, Donald R. 2006. Frontiers of History: Historical Inquiry in the Twentieth Century. New Haven: Yale University Press. ISBN 9780300120622. Machiavelli, Niccolò, Julia Conaway Bondanella, and Peter E. Bondanella. 1997. Discourses on Livy. World's classics. New York: Oxford University Press. ISBN 9780585110660. Mellor, Ronald. 1998. The Historians of Ancient Rome. New York: Routledge. ISBN 9780415912679. Montesquieu, Charles de Secondat, and Thomas Nugent. 1966. The Spirit of the Laws. London: Hafner. Niskanen, Paul. 2004. The Human and the Divine in History: Herodotus and the Book of Daniel. Journal for the study of the Old Testament, 396. Edinburgh: T & T Clark. ISBN 9780567082138. Pashley, Robert. 1837. Travels in Crete. London, UK: J. Murray. Polybius, Evelyn S. Shuckburgh trans. 1889. The Histories. New York, NY: Macmillan. Polybius, W.R. Paton. 1922-1927. The Histories. Cambridge, MA: Harvard University Press. Polybius, Jac. Gronovius. 1670. Polybiou tou Lykorta Megalopolitouo Historion ta sozomena Vol 1. Amsterdam, NL: Antiquariaat Brinkman. Polybius, Jac. Gronovius. 1670. Polybiou tou Lykorta Megalopolitouo Historion ta sozomena Vol 2. Amsterdam, NL: Antiquariaat Brinkman. Polybius, Frank W. Walbank, and Ian Scott-Kilvert. 1979. The Rise of the Roman Empire. New York, NY: Penguin Classics. ISBN 0140443622. Shotwell, James Thomson. 1922. An Introduction to the History of History. Records of civilization, sources and studies. New York: Columbia University Press. Tufte, Edward R. Minard's figurative map of Hannibal's war. edwardtufte.com. Retrieved October 25, 2008. Wilde, Oscar. 1997. The Rise of Historical Criticism. Cork, IE: University College. This page was last modified on 23 February 2009, at 22:09.